In making the Graham Pull Apart Breakfast Ring on Sunday, I was required to reduce a cup and a half of Golden Grahams to crumbs. I dumped the cereal into a plastic bag, pulled out the tenderizer hammer and started pounding. About half-way through the process I realized this was rather relaxing. Think about it. 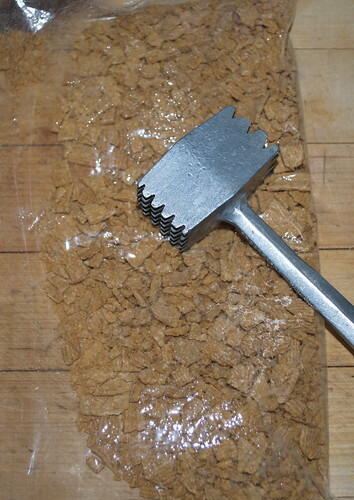 You have a mallet and you're reducing something to crumbs by pounding on it. Is it a measure of the violence in society that beating on something is relaxing? Thump. Thump. Thump. Crunch. Crunch. Crunch. From large pieces to crumbs. This mallet is really designed to tenderize meat. There are two sides to it, small and large spikes. You'd use the large spikes to make swiss steak. That is created, for those who don't know, by pounding a steak and then braising it in a sauce. The small spikes are for use on chicken. Pounding the breast pieces flatter is great for chicken kiev, for instance, where you're putting ingredients inside the chicken breast and rolling it up. I use the flat side for crushing things, like cereal. I stood in the kitchen on Sunday morning, thinking of all the things that irritate me right now. Lack of funds? Pound pound. Rheumatoid Arthritis? Pound pound pound. Cracked top on the Jeep? Pound pound. Raccoons knocking over the flowers on the deck? Pound pound pound. With each pound, I willed the offense to go away. I ran out of irritations so I had to create some. By the time the cereal was reduced to the crumb size I needed, I felt much better about the day. So, I'm going to have to remember this. The thing is, I don't need crumbs of everything and I might wind up with bags and bags of crumbs depending upon my stress level. Oh well, it beats keeping everything inside and gee, I haven't had swiss steak with noodles in ages.